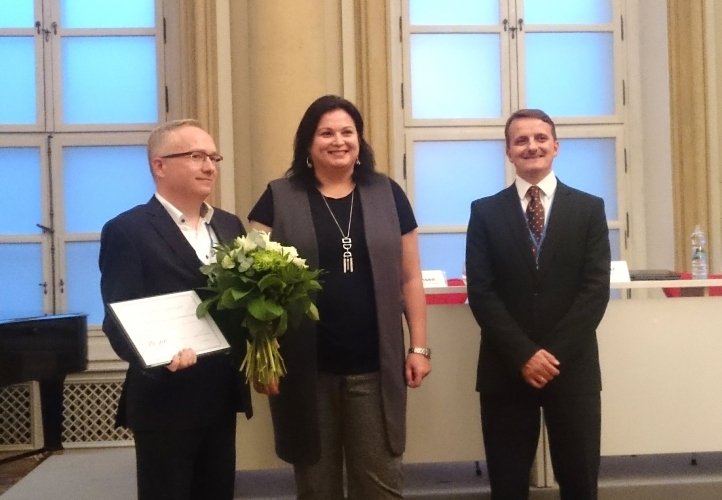 In connection to the Bratislava meeting, EAEA was awarded the AIVD Award for its contribution to adult education in Slovakia. On the left, EAEA President Per Paludan Hansen, Monika Korkošová from the Ministry of Education, Science, Research and Sport of the Slovak Republic, and Klaudius Silhar from AIVD in Slovakia. For decades, non-formal adult education providers and associations have advocated a holistic approach to adult learning. From basic skills – including adult literacy and numeracy – to second chance education to language, ICT, transversal and social skills, non-formal adult education covers a large array of learning offers for the enhancement of the individual, communities and society. This focus distinguishes it from learning for the labour market or a specific job. Why are we in non-formal adult education now suddenly talking about adult education and employment? “Adult education and employment – are they natural allies or enemies?” – this question was raised by Katarina Popovic, ICAE Secretary General, at the EAEA policy debate on employment in Bratislava on 18 October 2016. She highlighted that long throughout history, general (or “liberal”) education was only accessible to a relatively small elite. At the same time, as societies progressed, practical trainings for crafts became increasingly important, and, while still not being accessible to everybody, they enabled a broader part of the population to acquire more specialised knowledge and skills. Adult education movements in the 19th and 20th century, together with shorter working hours, made it possible for workers to educate themselves and learn about politics, culture, literacy and other non-job related subjects. “What we see today, however, is a dominance of adult learning for employment,” Ms Popovic said. “We can witness a schizophrenic phenomenon: at the one hand, civil society – the main provider of non-formal adult education in many countries – incorporates vocational education and training in their programmes; on the other hand, private companies promote civic education and social skills. What is their interest in doing so? “Maybe we are looking at a false dichotomy because both sides of learning are crucial. There is no better way to empower someone than to get a job and keep the job,” she said. There is also another dimension to it: employed adults are more likely to participate in adult education offers than unemployed or inactive persons. Moreover, a main motivation for adults to participate in adult learning is to further their career prospects. The discussion about the role of non-formal adult education in employment goes to the core of what distinguishes non-formal adult education from vocational education and training and formal adult education: while non-formal adult education (in its diversity) puts the learner at the centre and looks at the interaction of the individual with the wider societal context, vocational education and training looks at the professional development of the individual. Instead of reinforcing these different approaches, Ms. Popovic suggested to rethink the language and terminologies around education and learning and the concepts and values that terms such as “human capital”, “employability” and “skills” entail. “When we refer to ‘skills’, we mean all knowledge and competencies that translate into what a person can do in terms of her or his profession, but also how a person interacts with the community,” said Dana Bachmann, Head of unit for adult education in DG Employment at the European Commission. “With the Skills Agenda, we want to complement the well-established field of adult education. It tackles a broader set of skills than those directly related to employment and includes literacy, numeracy and digital skills as well as transversal and social skills,” she elaborated. Monika Korkošová from the Ministry of Education, Science, Research and Sport of the Slovak Republic also highlighted the potential of this shift towards integrating non-formal adult education and vocational education and training for the Slovak context. While the success of the Slovak example is encouraging, creating and re-creating adult education structures might be more difficult in other countries if state funding does not change considerably. Still, the new direction of the European institutions regarding skills for life and skills for work could be a game changer in some contexts, leading to new partnerships between governments, employers and adult education providers. “An integrated approach should not mean to neglect the values of non-formal adult education, but rather to enrich skills trainings for employment and work-based learning,” a participant of the debate said. “There is so much experience and expertise that adult education can offer, also in terms of methodologies,” said Joyce Black from the Learning and Work Institute. EAEA has published the Policy Paper “Learning and Skills for Adults in Europe” in December 2016. The discussions at the policy debate in Bratislava on 18 October 2016 fed into this document.